With the World Wildlife Fund BankAmericard Credit Card you can access your account online from the Bank of America platform. 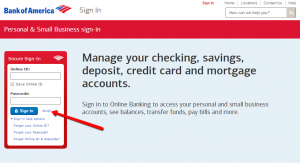 In case you have any concerns about internet banking access, we show you here how to handle the login, registration and credentials issues. Step 1: From the card’s main webpage click on the ‘Sign in’ button. You’ll be directed to another window where you’ll be asked to provide your credentials (Online ID and Passcode) for your secure Sign-in. 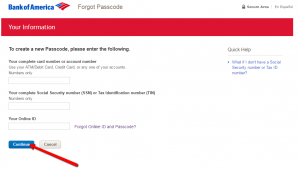 Step 2: Enter your Online ID and Passcode in the appropriate spaces and click the ‘Sign-in’ button. 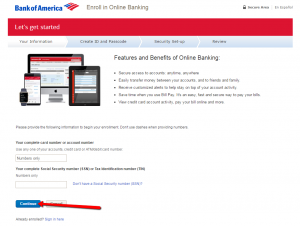 Step 1: Visit the Bank of America Sign-in page and click on the ‘Sign-in help options.’ This will open up the three options including ‘Forgot your Online ID?’, ‘Forgot your Passcode?’, and ‘Forgot Online ID & Passcode?’. 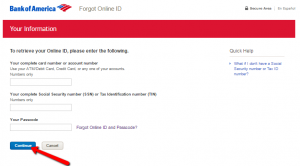 Step 2 (Online ID): After having pressed the ‘Forgot your Online ID?’ button, enter your 1) ATM/Debit Cardnumber, Credit Cardnumber, or any one of your accounts number, 2) your complete Social Security number (SSN)/Tax Identification number (TIN) and 3), your Passcode and then press ‘Continue’. Step 1: From the Sign-in page click on the ‘Enroll’ button. 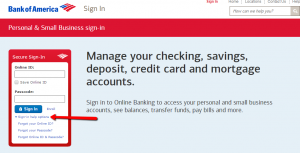 This will open the new page for creating your online banking account. Step 2: Enter the required information in the appropriate spaces including 1) Your complete card number or account number (you can use any one of your accounts, credit card or ATM/debit card number), 2) your Social Security number (SSN) or Tax Identification number (TIN), and then click on the ‘Continue’ button. 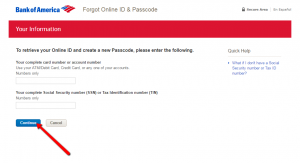 In the next pages you’ll be asked to create your unique Online ID and your Passcode for future accessing your online banking. After that you can set up your security questions and review your provided data. Q: Who is the World Wildlife Fund BankAmericard credit card good for? The World Wildlife Fund BankAmericard credit card is a pretty good in case you want a no annual fee card which allows you to earn 3 percent back on gas purchases and 2 percent back on grocery and wholesale club purchases for the first $2,500 in combined spending each quarter. Also, you can get 1 percent back on all other purchases. So, for the people who spend money on gas and groceries regularly, this card is definitely a good choice. Additionally, the sign-up bonus of $150 only requires $500 of purchases in the first three months, which is achievable for people who do not spend a lot. Nevertheless, it is good for people who want to make the world a better place since you will essentially be donating to the World Wildlife Fund just by holding and using this card. Q: What are the advantages of having a credit card, and is it worth the effort, since I am trying so hard to get one and whichever card I apply to, they always decline me? Credit Cards became essential nowadays and people find it very useful, considering the fact that they do not have to take cash with them when shopping, or in case they make unplanned purchase. Also, since most of the services like hotel reservations, renting a car, or simple online purchase are performed via Credit Cards, this is a useful means of payment. Credit card is a borrowing tool by which you can manage your finances in case of unexpected emergencies. If you are constantly declined when applying, maybe you can try becoming an additional user onto somebody else’s account for some time, so as to get a nice boost on your credit score from that. You can also apply for some store cards because it is easier to get approved for them or a secured card which is designed so as to help the cardholders build their credit score.